The Kindle e-reader has become one of the must have travel accessories of modern times. It allows you to carry a whole library in your back pocket, without the burden of lugging books on your adventure. There are other e-reader brands on the market, but at team Travel Mono we are mostly Kindle owners. With that in mind we decided to see which is the best Kindle for traveling. Currently there are four Kindle e-readers available to purchase. The Kindle, Kindle Paperwhite, Kindle Voyage and Kindle Oasis. Each has a slightly different set of features depending on what you need in an e-reader. We will take a look at each model to see which is the best Kindle e-reader for traveling. 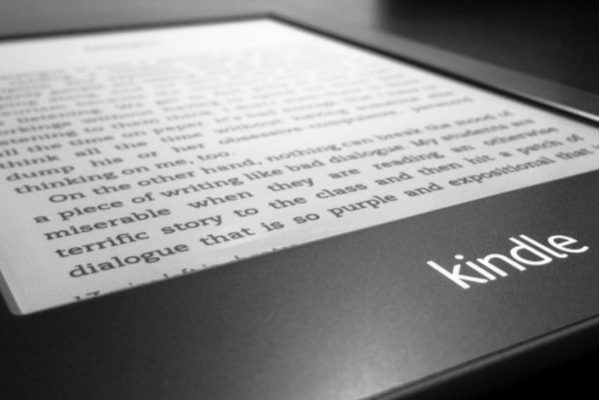 The Kindle is Amazons base model e-reader, and the device with the lowest retail price. It can be purchased with or without special offers. This basically means you need to pay a bit extra to remove the on screen ads. We would agree it is worth the extra payment to remove these ads, but they dont cause too much inconvenience. There is no built-in light on this version so the screen is a grey tone. As with a traditional hard copy book you will need external lighting to read at night. This is also the lightest model at 5.7 oz (161 g), making it great for traveling light. If you want a simple no frills e-reader to just read e-books, you cant go wrong with this model. The manager of our Travel Mono Store owns this device and swears by it; as a “does what it says on the tin” e-reader. Simple, economical and great value. The Kindle Paperwhite is the next model up, and is similar to the standard Kindle but with a few added extras. As with the Kindle, It can be purchased with or without special offers. This basically means you need to pay a bit extra to remove the on screen ads. While the Kindle only has wi-fi as standard, the Kindle Paperwhite has wi-fi and a cellular wi-fi as an optional extra. This is ideal for downloading books on the road. Very useful for travelers who will be without a wi-fi signal for long periods. This version also has a built-in light. These are front lights which guide light towards the display surface. This prevents light shining in your eyes for long periods while reading, as you would experience with back lighted tablets or smart phones. Slightly heavier and bigger than the standard Kindle. Increases in weight further if you have the cellular option added. The Kindle Voyage has all the features of the lower priced models. But with a sleeker design, and is lighter and smaller than the Kindle Paperweight. The lighting is upgraded with adaptive technology. It will auto adjust to various lighting conditions for optimal reading comfort. Amazon has reached a new level of paper clone technology with this system, and the design of the Voyage enhances the similarity with paper. The Voyage also has ‘page press´technology. Which allows the user to turn the pages uses a specially designed button. It requires only the lightest of touches with the thumb, and makes no distracting noises or clicks. The Voyage is the thinnest of all the Kindle devices at 7.6mm. The Kindle Oasis is the top of range of the Kindle e-readers, with some very different and impressive features. Unlike all the other three Kindles which have a 6″ screen, the Oasis offers a larger 7″ screen. The design deviates from the standard shape of other devices and features a thicker vertical edge along one side (8.4 mm). This is intended for one handed reading. The rest of the screen is a slimmer 3.4 mm. This may sound peculiar, but when you get used to the shape, it can be much more comfortable to hold. You can wrap your fingers around the back of the raised section with a firmer and more comfortable grip. The Oasis is also waterproof to 2 meters water depth, for a duration of no longer than 60 minutes. Waterproofing the Kindle could be useful for travelers who want to read near a pool. Maybe even on a lilo in the pool. At Travel Mono we are habitual coffee spillers. We have not tested this notion, but we hope the Oasis is coffee proof as well. We will keep you updated on that one. Also has increased storage capacity options of 8gb or 32gb. Kindle Unlimited is a subscription based Amazon eBook service. For a monthly fee you will be given access to over 1.4 million eBooks in the Kindle store. But you can give it a try absolutely free for 30 days. This is great if you are an avid reader, and you will probably need to read at least 3 or 4 books per month to make it worthwhile. The Kindle Unlimited catalog consists of eBooks from the Amazon publishing scheme. Most best sellers and eBooks from the big publishing houses are not part of the scheme. Membership plans of 6, 12 and 24 months are available. Unlimited access to over 1.4 million eBooks. Can be used on any device using the Kindle app. Can be purchased as a gift for someone else. It is not completely clear which Kindle is the best for traveling. Each model across the range has its pros and cons. The Kindle is perfect for those on a budget. Super light and and simple. The Kindle Paperwhite has added cellular functionality (extra cost) and a paper quality display. The Kindle Voyage is next level screen technology and design. But is a big increase in retail price. The Kindle Oasis is a more expensive again, but has increased screen and storage capacity; plus waterproof. At Travel Mono we are big fans of the two lower level models because of the great value they offer. Unless you really need a waterproof Kindle or increased storage then these two devices are more than adequate. It is estimated an 8gb Kindle can store 6,000 e-books, so 32gb seems excessive, unless you are a big audio book listener. If you buy a standard Kindle you will save enough money for at least one year of Kindle Unlimited subscriptions. Now thats a deal! Whichever Kindle you choose, we hope you get a lot of enjoyment out of it. Happy reading and happy traveling!